The Object 906 is a Rank VI Soviet light tank with a battle rating of 8.0 (AB/RB/SB). It was introduced in Update 1.65 "Way of the Samurai". Combining a similar gun to the ASU-85 on a turreted device and mobility from the PT-76B, the Object 906 is a perfect flanker. Belly armour and hull underside above the tracks are 8 mm thick. Ammo racks of the Object 906. 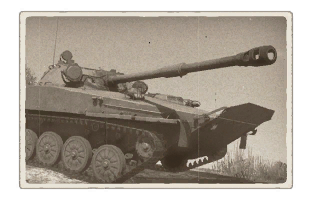 As with every other light tanks, this vehicle should be handled with caution on the battlefield since any enemy the 906 encounters can penetrate it. Use it's awesome mobility and good, stabilized gun to provide a nasty surprise to the enemy from unexpected spots. Whether by river, lake, ocean, the 906 can navigate through all bodies of water within the limit of the battlefield. This tank is best used as a flanker, shooting on the move, reloading in the dark, popping up behind another hill to take another moving shot, this is a ninja tank. For your ammo loadout: Take 20 shells in total, this removes the ammo rack at the back of your turret. Take more if you want to boost yourself by firing your gun to the opposite side of where you are driving. Two thirds APHE and One third HEAT-FS is recommended. Warning: with its 4.3 second reload though, taking less ammo puts you at risk of running out. Never fight an enemy head-on since the 906 will have to aim for the enemy's weak spots before firing while they don't have to worry about the same precision. Surprise is the 906's greatest advantage since there is no other amphibious rank V vehicle (as of update 1.69 Regia Aeronautica). Use the Object 906's great speed to take strange, curvy, distant paths to snipe the enemy from the rear/side early in the game. Do not forget to change cover often (every 2-3 shots) since those enemies can respawn and go straight towards the original firing position with its front armour towards it, resulting in much more difficult shots. In this case, use the 906's speed to fall back behind much more armoured allies and look at the map to see where allies may need help/where an enemy has been holding out for long. When flanking, unlike many other tanks: show the side armour. Since the armour cannot block any shot at this BR, speed is the Object 906's best option, just evade the shots and slow down solely to shoot at the enemy. In the occurrence the tank gets hit, keep in mind that this lengthy vehicle makes APDS and HEAT rounds ineffective since they often pass straight through, such shot from the front could incapacitate all three crew members. Taking shots from the sides "isolates" each module for non-HE shells in such a way that they will only incapacitate one part of the tank at the time: the driver, the gunner or the engine. If the engine or driver gets shot, the inertia will often drag the 906 out of sights from the enemy. If the gunner gets shot, the 906 can still move behind cover to hide, the lack of gunner would then prevent the player from exposing the tank in an area the enemy knows is there. Just like a ninja, after taking a shot: hide, repair, reevaluate the situation, then move out to cause more havoc from unsuspecting locations. If an aircraft is aware of your presence search cover or hide in a treeline, Do not give away your exact location to the aircraft by firing at it. Putting bushes on top of your tank is a good idea. One may be tempted to charge and capture the point for the team at the beginning of a game. In such a case, a cooperative team is necessary since the 906 cannot hold the point all by its lonesome. When capturing the point, turn the engine deck towards the enemy. This tactic can actually save the 906 from hasty shots to the hull without hindering the gun arc, though this will cause engine fires which can lead to a burning end if not handled quick. In this case, take a shot at the now vulnerable foe and then use the FPE item to extinguish the fire. If the point gets swarmed by enemies, fall back and wait for allies to regroup for a counter-attack. Another unusual tactic is to attract enemy players' focu to the 906's location. Use the amphibious capability and other great mobility features to put the 906 in a tricky position to reach for a non-floating/non-flying enemy (often down a cliff, beside/in the water) in such a way that some players will fall into the trap of trying to reach the 906 through methods that exposes theirs sides to allies or falling into the water. This tactic is very situational and is not a method that should be prioritized over any other tactics. It may not win battles, but it could destroy a few enemies, reducing the number of enemies threatening the overall allied team. The Maus has thick flanks at nearly 200 mm that can absorb any shots if angled properly. Do not shoot at it since it will only bring this behemoth to turn itself against the 906 (in this case, just withdraw from its firing arc). Still, it can be defeated in a manner like mammoth hunting : wait until the target gets isolated and encircle it, then shoot it on the sides, in the rear of the hull and always try to be out of its line of sight. 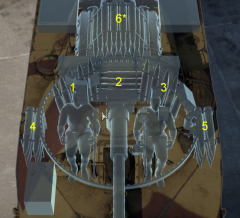 T95 (otherwise known as "Doom turtle") should not be engaged. Its good all-around bouncy armour will defeat most shots even from the Object 906 will take on the move. To defeat it, take some height at its flank and aim carefully, otherwise, it will just drag its attention. This worthy opponent has a very fast hull turning rate, turning it into an impervious wall even towards any adversary, including the 906 if it notices it. Engage only if necessary. With the Tortoise, same caution is advised but it is way easier to flank since its side armour is flat. Be cautious while aiming at IS-3, IS-4M and T-10M since their sides can bounce the 85 mm shots. Turret front is vulnerable to HMG at short distances. Mobility and Accuracy are bad. The success of the PT-76 amphibious tank prompted development of a successor with improved characteristics on the battlefield. The PT-76 chassis was taken up by the Stalingrad Tractor Factory in 1962 to be improved. The vehicle was given the project name Object 906. Two were produced and tested between 1962-1963, each armed with a 85 mm cannon and also implemented the newer technology such as gun stabilization, auto-loader, and a welded aluminum armour for weight-saving. The design proved reliable with a 300 hp engine and could reach a top speed of 75 km/h. 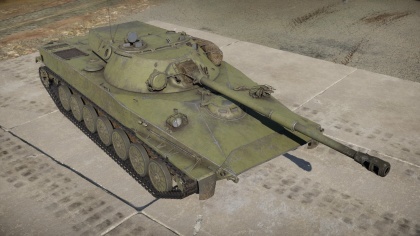 Had it been adopted, the Object 906 would've been given the name PT-85, but the vehicle design never left the prototype stages and consequently never adopted. A single prototype still exists in Kubinka Tank Museum. The Object 906 should not be confused by another project of the same name and purpose to upgrade the PT-76, though this one had a 90 mm D-62 gun and never left the drawing boards. There was also a separate PT-85 that also had a PT-76 chassis with a 85 mm gun, though this model had a cast turret. "Light Tank Development Prototype." Preserved Tanks .Com | Tank Types. N.p., n.d. Web. 05 June 2017. Website. War Thunder. "[Development] Object 906: River Mosquito." Object 906: River Mosquito. N.p., 24 Nov. 2016. Web. 05 June 2017. Website. This page was last edited on 13 January 2019, at 19:30.